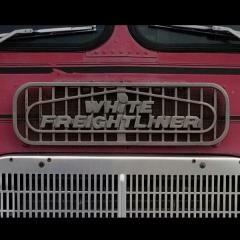 One of my favorite trucks! Looking forward to more! Welcome to the Build Off! I love it too. It was the very first big rig I ever built when I was a teenager (about 40 years ago). I search my parents' house every time I get back there to try and find it again but haven't had any luck. I built it straight out of the box -- no paint -- but I didn't care. It was just fun to build. This kit has a bad case of "chrome-itis". LOL. Will need to restock my Easy-Off oven cleaner. Of course it's been too long, but I don't remember the original release (same box art) having the Detroit 8V engine ? I just don't remember. 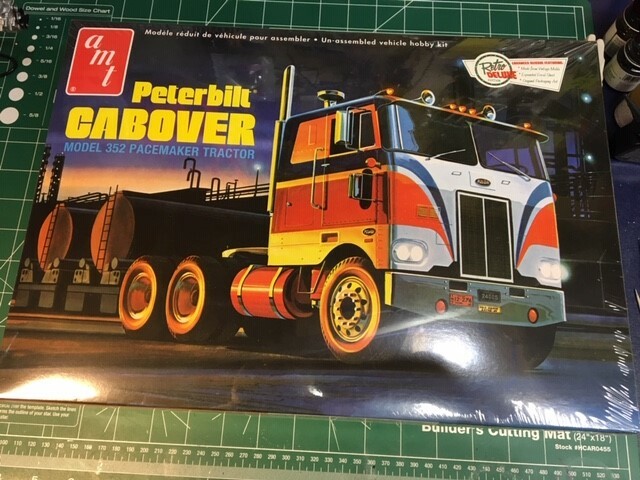 I have an older kit of the same truck sitting on one of my shelves, it has the 8v in it. 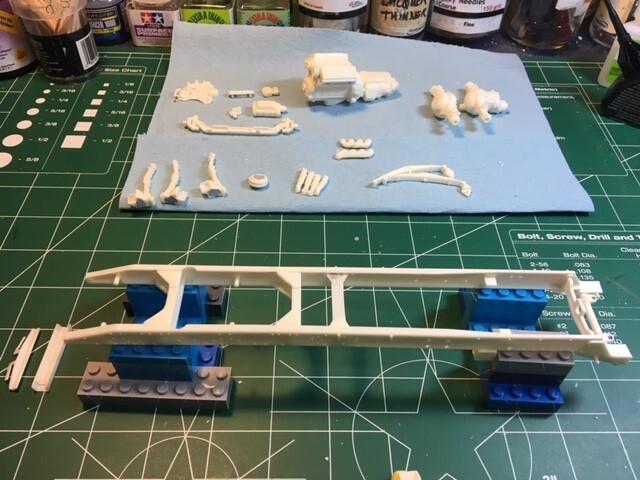 Got some of the engine together this weekend, and got the frame rails and cross members cleaned up. Also got some chrome stripping done... seriously ? a chrome oil cooler ? chrome headers ? Had to really work on the cross members to get them "square" (they were actually "V" shaped). Luckily the ejector pin marks on the frame rails were easy to get to and clean up. I'm not crazy about the fact that there isn't a "positive alignment" with the cross members and the frame rails to make sure the frame is straight and square (i.e. bosses or pins). Plenty of COEs to go around. Love the variety. These Petes are one of my favorite. I especially love when they look well used. Hey guys -- looking for some advice/help here. 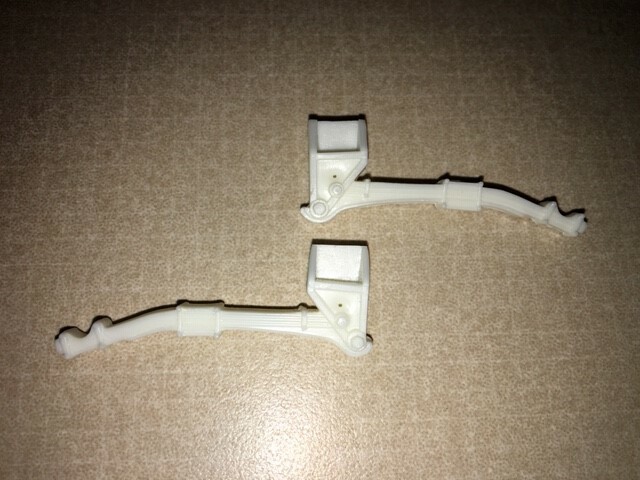 I've got some holes in the spring mounts that are in an area too small to get in and sand if I tried to putty them. What do you do with these ? Good idea... medium ? thick ? I thought about that... just haven't tried it before. Well.. spent the afternoon down at the bench. Mostly more clean-up on this "flash monster", so not much to show for 4 hours of work I'm afraid. Had the 1985 Valleydale Meats 500 race on to watch while I worked - so that was nice. Next weekend the frame is going to get glued to together so hopefully will have more to show then. Ya, flash/seam clean up can chew up time in a hurry, but it’s part of the game on these kits. Looking forward to seeing more progress on this. I'm sure you'll have this whipped together in no time ! Even 30 minutes each night help finish small steps then suddenly its built ! Well, spent the afternoon sanding and doing more clean-up on all of the springs and axles.. not much to show for it. Mold lines everywhere ! LOL. Enjoyed having the 1985 Talledega 500 on while working, though ! Got the frame mostly glued together this weekend while watching the 1987 Atlanta 500 and the Motorcraft 500 races. Also got some of the other suspension parts cleaned up and the axles together. I need some help on a couple items -- I've posted that in the "Truck Stop" board. I've still got my old 352 from about 20 years or more ago. Had to put a new bumper and hinges on it though. After years of being in storage and moved around they had enough.. Can't wait to see yours come together though!! Getting the rear suspension on now. Will post an update pic tomorrow. 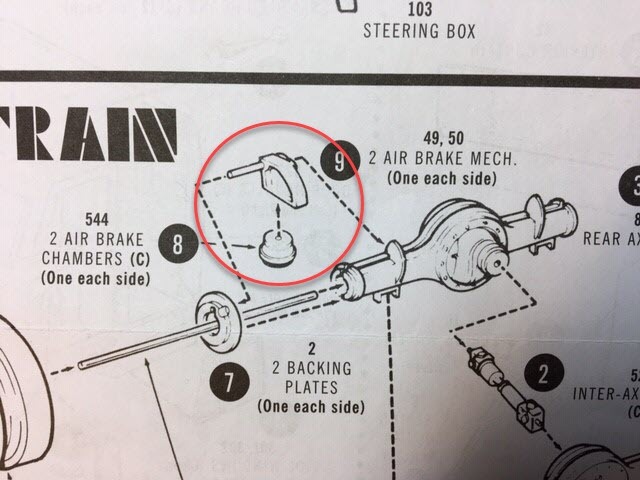 Can anyone post a pic of your 352 axle to show how these brakes are supposed to be attached? The AMT instructions are a bit of a mystery. 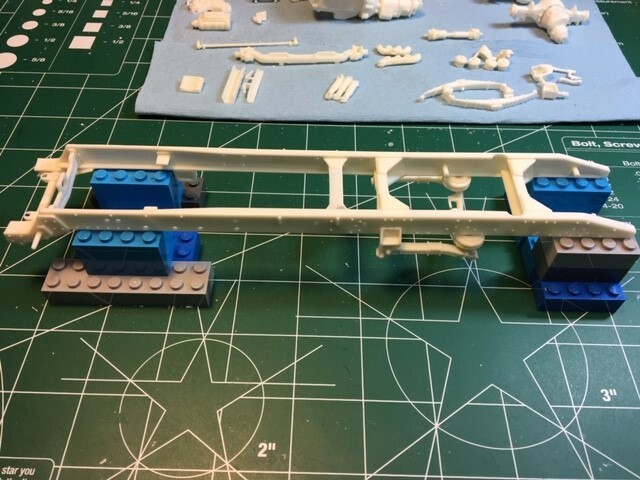 I'm building the same kit,,,without the instructions. 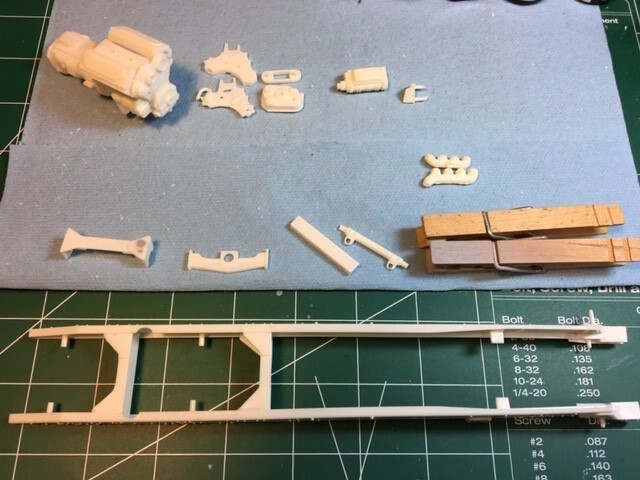 These Amt kits are a mystery. You can find instructions here Clayton. They have instructions for most of the truck models sorted by kit manufacturer.